The Best Pavlova Recipe Ever! 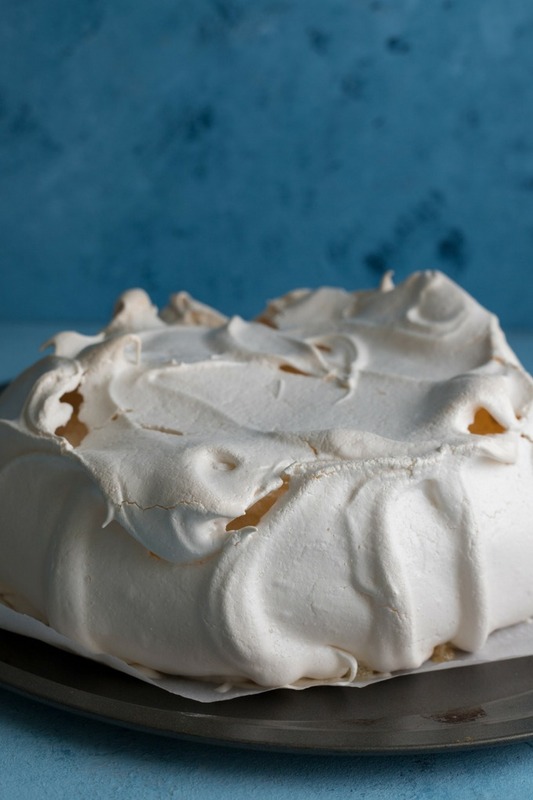 An Aussie classic, this is really the best pavlova recipe ever! Make sure to follow along with my tips and tricks so that you can make the best pavlova at home with ease! Perfect for summer and holiday celebrations, wow your guests with this gorgeous dessert! IT’S FINALLY HERE!!!! The best pavlova recipe ever, and I am SO excited to share this recipe with you today! I’ve been wanting to make this on the blog for basically forever, but just never got around to taking the photos of the finished pav! But here it is, and I am so proud to be sharing with you today, what is my favourite Aussie dessert! Not to brag, but I am the pavlova master in my family. I’ve been trying and testing my pavlova skills for years now, and for some reason, I’m the only one that ever seemed to get it right after many attempts! I’ll always remember my brother frustratingly call me, asking why his pavlovas never turned out like mine! Well today, you’ll learn my secret tips and tricks for making pavlova. Pavlova is a recipe that we usually make for Christmas back at home. It’s the perfect summer dessert because it’s cold, light and usually stacked high with berries! I always make it at Christmas time in the US to bring a little bit of home to our holiday season. This dessert has also wowed a lot of our friends at home and at parties. My bestie Eve demanded I made her a pavlova for her birthday, and we’ve taken it to various parties as our signature dessert. I can’t count how many times Americans have absolutely lost their mind tasting it begging me for the recipe! Pavlova is the dreamiest dessert in the world. If you can imagine, a light, fluffy marshmallow centre, surrounded by a crispy shell, topped with whipped cream and berries – it’s basically a cloud of dessert! It’s a heavily debated topic whether pavlova originated in Australia or New Zealand, but being bias, I’m saying it’s Aussie! 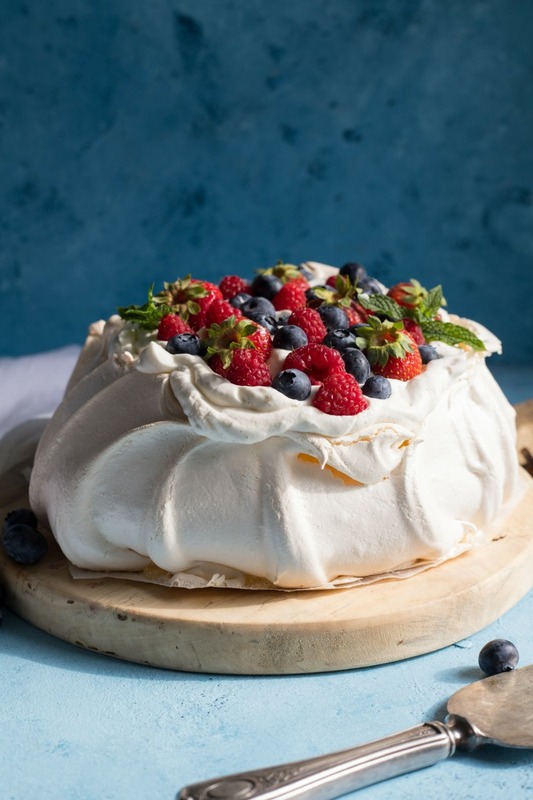 Pavlova actually requires only a few simple ingredients – eggs, sugar, white vinegar, cornstarch and vanilla, plus the toppings for the end. It’s definitely one of those desserts though, that can be easy to make, but really easy to mess up! Which is why I am sharing my top tips for making the best pavlova ever! Be prepared, however, this will end up taking almost half your day (with most of it is resting time), so make sure you allow plenty of time before you need to actually serve the pavlova! I like to make mine the morning of my dinner or event so that I have plenty of time in the evening to dress it before serving. 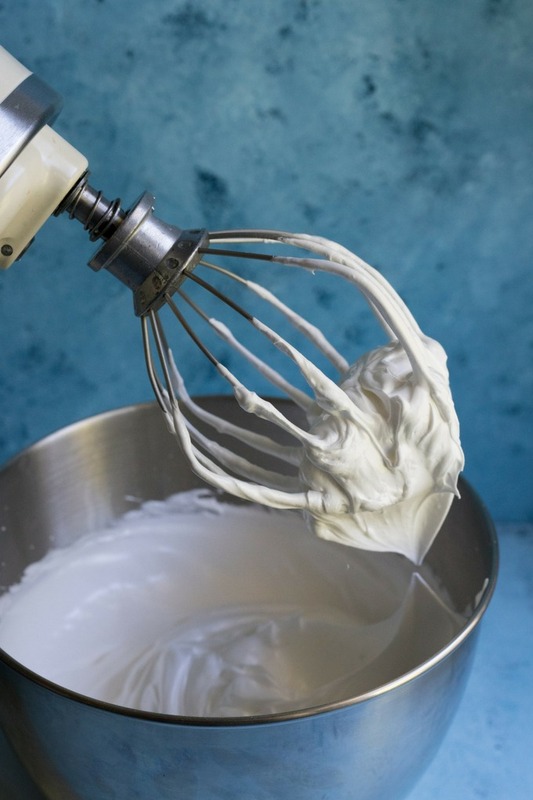 The egg whites need to come up to room temperature so that they whip better. The best solution is to separate the cold eggs first into a bowl, then bring the whites to room temperature. Initially, the egg whites need to be whisked until firm peaks appear. The best method to turn the bowl of eggs whites (very, very carefully) upside down. If they start to slip and slide, they need longer. If you can hold the bowl upside down and they don’t move, they are whipped enough! 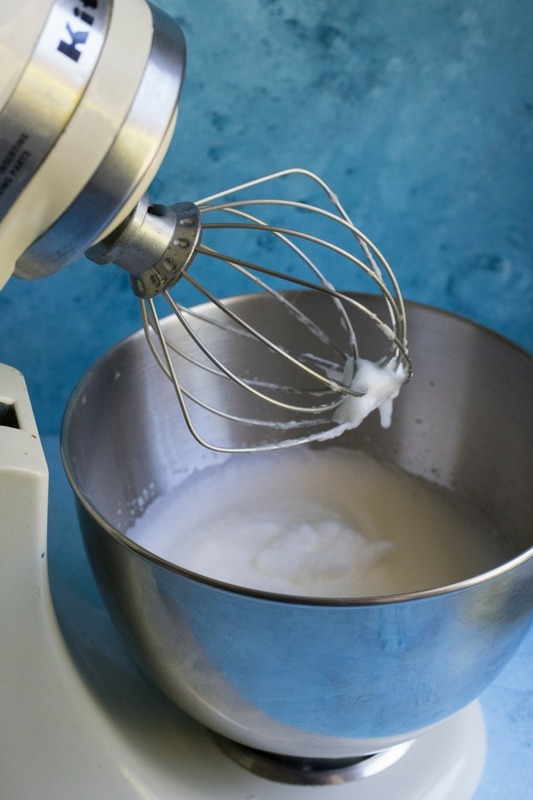 Use a clean whisk and clean bowl, and there must be absolutely no egg yolk in the egg white mixture. The sugar needs to be incorporated well to avoid sugar syrup seeping out of the pavlova. A good indication is to get a little bit of the meringue and sugar mix and rub it gently between your thumb and finger. If it feels grainy, keep whisking. Once the sugar is incorporated keep whisking for around three minutes. This will really stiffen up the mixture and make it easy for shaping. Once the vinegar, vanilla and cornflour are added, you only need to whisk the mixture about 30 seconds more to ensure it is only just whisked in. Preparing the pavlova for the oven is important. I cut a piece of baking paper/parchment paper into a round sheet, and place it on a round pizza oven. To keep it in place, take a 1/4 of a teaspoon of the meringue, and dab it onto four spots on the outside of the paper round to keep it in place. Shaping the pavlova is also important. I start by spooning all the pavlova mixture out onto my prepared oven tray. Then, using a spatula, I very carefully shape into a round shape. Start from the bottom, and make upward movements. The top will naturally form together. I don’t tend to make a small mound in the middle because I find one naturally forms when the pavlova cools (see images for shaping!). Preheat the oven to 300F/150C first, then reduce the oven temperature to 250F/120C when you put the pavlova into the oven. Very important!!! DO NOT OPEN THE OVEN throughout the cooking time! If you need to check on it, use the oven light, but do not open the oven! Also VERY IMPORTANT!!! Once the pavlova has had 1 hour and 15 minutes in the oven, turn the oven off and leave the pavlova to fully cool for around 2-3 hours. By allowing it to fully cool in the oven, you are reducing the chances of the pavlova cracking! You can see the baked pavlova has settled leaving a slight indent in the top. 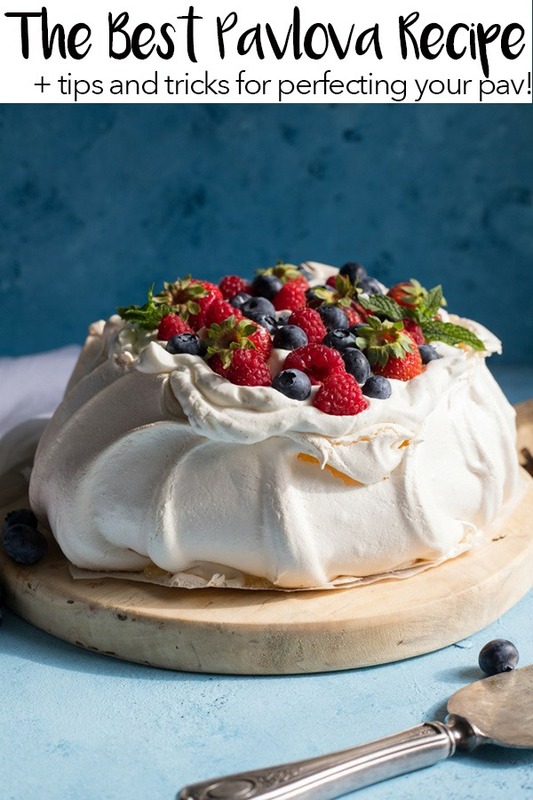 Traditional toppings for pavlovas are cream and fruit. I love using a mixture of seasonal berries such as strawberries and blueberries. Passionfruit is also a good option, but personally, I don’t think you can go wrong with cream and strawberries! This best pavlova recipe is a must try if you are looking for a dessert that totally WOW’s your guests! This serves up between 10-12 people, depending on serving size, and I guarantee everyone is going to absolutely love your show-stopping dessert! Light and fluffy marshmallow surrounded by a crunchy outer shell! 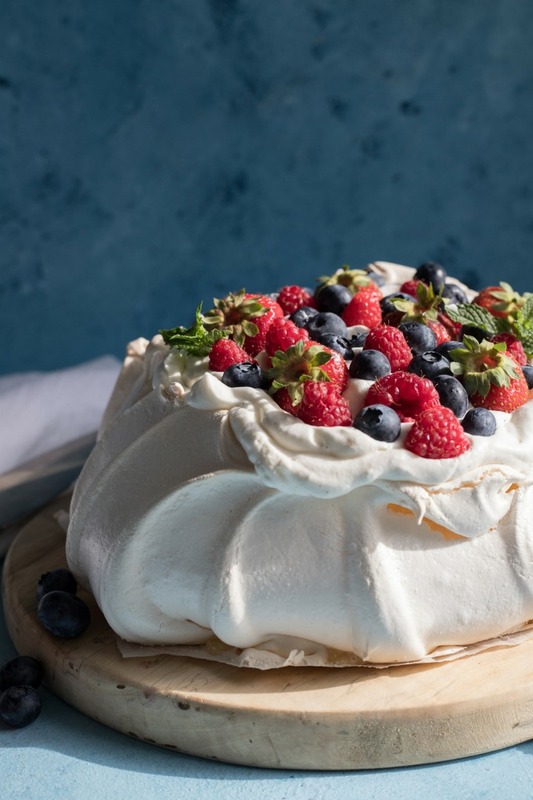 This recipe is truly, the best pavlova recipe you'll ever find and by following my tips and tricks, you'll be making your own beautiful pavlova in no time! In a large, clean bowl, whisk together the egg whites and salt until stiff peaks form. Gradually add sugar, 1/4 of a cup at a time and whisk after each addition for about 1 minute. Whisk until sugar has dissolved. To test to see if it's dissolved, gently rub a little bit of the meringue mixture between your fingers. If it's grainy, keep whisking. After the last of the sugar has been added, whisk on high for 3 minutes. The mixture should be very thick and glossy. Combine the cornflour/cornstarch, vinegar and vanilla essence in a very small bowl. Add to the meringue mixture and whisk until just combined. Line a 12" round pizza tray with a piece of baking paper/parchment paper cut into a circle. Start scooping out the meringue mixture, forming a circle roughly 8-9" in diameter. Use a spatula, to gently start shaping your pavlova. Start at the bottom and gently make nice neat lines moving toward the top of the pavlova (see image). Reduce oven temperature to 250F/120C and place pavlova in the oven on the middle shelf. Cook for 1 hour to 1 hour and 15 minutes. Turn on oven light to see the pavlova. The pavlova should be lightly browned. If you to, quickly open the oven door and touch the pavlova. It should be dry to the touch. To serve, whip the cream, and gently spoon into the centre of the pavlova. Top with fresh berries. If you love this best pavlova recipe, then you’ll love my vanilla meringues with blackberry pinot sauce, or my chocolate mini meringues! 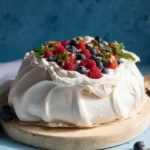 I love pavlova and your recipe for it looks amazing! thanks Danielle! pavlova is definitely my all time favorite dessert! This looks wonderful! I’ve never had Pavlova now I’m eager to try it! it’s SO SO good! you have to try it, you’ll love it! 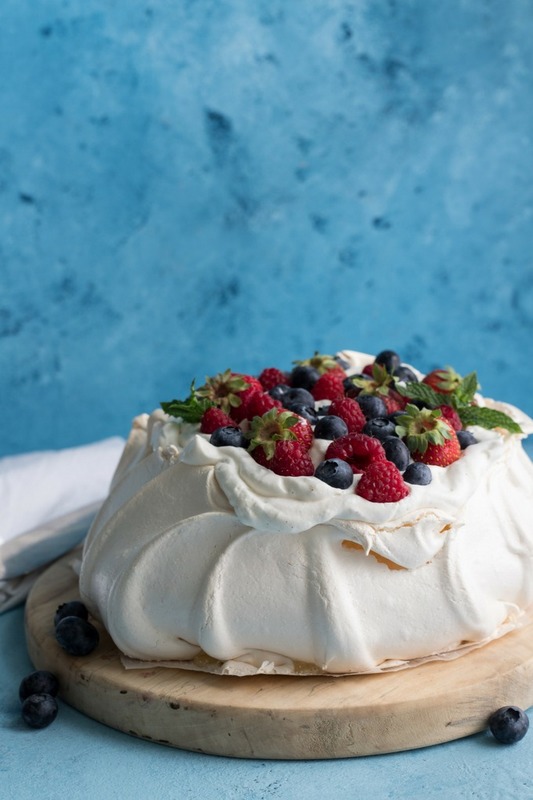 You can’t beat a pavlova for a classic summer dessert. The more berries the better I say! I totally agree about the berries! I love just throwing a whole bunch of strawberries on the top! I love pavlovas, they’re one of my favorite spring/summer desserts. I’ll have to try your trick of leaving it in the oven after it’s done cooking to reduce some of the cracking. yeah it’s a game changer, you just need to be patient that’s all! and the only other downside is if you’re entertaining, you can’t oven cook anything else for a while! 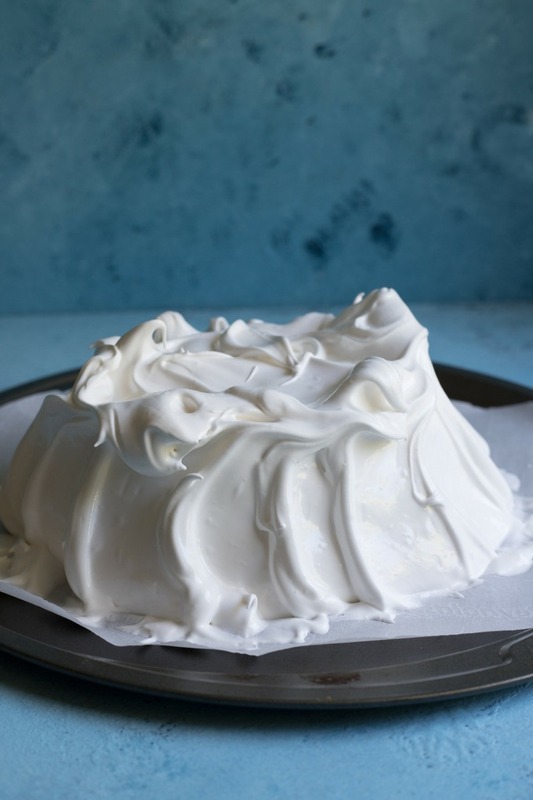 I LOVE pavlovas, and when I saw the first image in this post, I literally sighed out loud! These look soooo good! ha ha love it Renee! thank you! pavlovas really are the best desserts going around hey! As I do not have any available? Hey Stephanie. Yes it does as it is the agent that bonds the pavlova together and makes it nice and tall. You can easily pick up some from the supermarket for cheap! Let me know if you have any other questions! Can this recipe be made ahead? Or should I make it at the time? Make it at the time, but it does take almost all day. Best to make it the morning of because it needs to cool for 3-5 hours before you can serve it! Hey the salt? Add at the beginning w egg whites aye? Couldn’t see it in the method.thanks. hmmmm I’m sorry that it didn’t work out Jean. The only thing I can think of is that maybe the egg whites weren’t stiff enough before you added the sugar? did you add in the vinegar and corn starch? that usually helps shape and cook the pavlova. I made this for the first time before Easter and it was amazing . I let it cool down completely in the oven all day and dressed it that nigh it was amazing the next day crunchy and even after three days still crunchy . I’m making this again for my aunties 90 th birthday this weekend. Thank you for you’re delicious easy recipe.